Few people would disagree that the US system of higher education and workforce training in science, technology, engineering, and mathematics (STEM) is plagued with a number of systemic problems. These problems compromise its ability to serve many of its students, the STEM enterprise, and society more broadly. 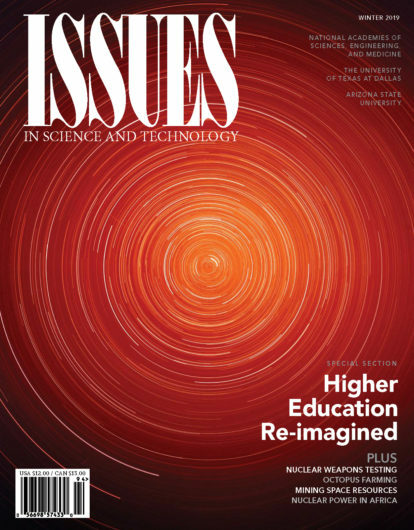 A special section of essays in the Winter 2019 Issues in Science and Technology draws from five studies recently released by the National Academies of Sciences, Engineering, and Medicine to present an array of practical policy solutions to well-recognized weaknesses in the STEM education enterprise. Alan I. Leshner and Layne Scherer note that since 1995 more than 20 studies and reports on graduate STEM education have concluded that STEM education needs to be modernized. To do so, they argue, federal and state funding bodies should adopt funding criteria that shift professional incentives toward maximizing student success. Ronald J. Daniels and Lida A. Beninson propose that reforming education and training for future biomedical researchers could be facilitated by a public-private council that brings together players in academia, industry, philanthropy, and government to develop coherent strategies for addressing a system that is decreasingly able to meet the professional aspirations of many of its students and postdocs. Effective leadership will be a part of that story, and John Bardo tells us how Wichita State University is teaming up with nearby businesses to help drive regional innovation and job creation; Freeman Hrabowski III and Peter Henderson of the University of Maryland, Baltimore County, explain what it means to get serious about minority-serving STEM education; and Richard K. Miller describes the groundbreaking approach to engineering education developing at Olin College. 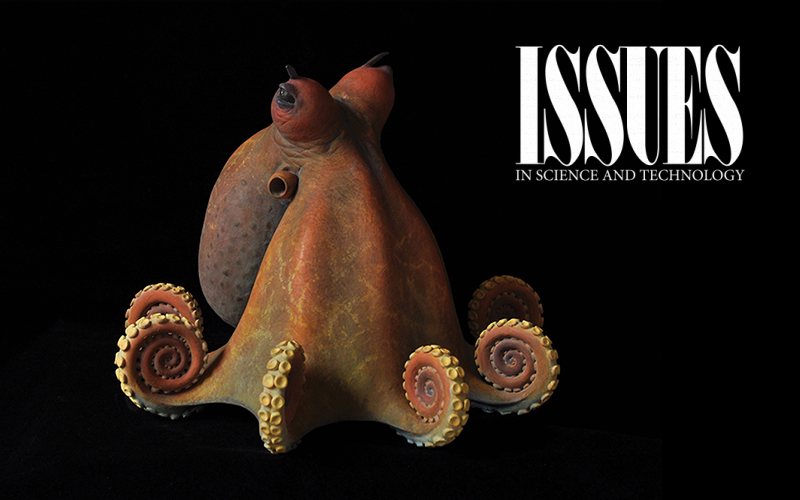 Also in this issue, Jennifer Jacquet, Becca Franks, Peter Godfrey-Smith, and Walter Sánchez-Suárez make a powerful case against raising octopus in captivity for food. Jessica Lovering and Kenton de Kirby find rich opportunities for deploying advanced nuclear reactors in Africa. John C. Hopkins and David H. Sharp argue that there is reason to question the robustness of computer simulations that predict how the aging warheads of the US nuclear weapons stockpile will perform. Ian Christensen, Ian Lange, George Sowers, Angel Abbud-Madrid, and Morgan D. Bazilian offer policies that can advance the prospect of space mining. And Robert Frodeman explores the hidden life of science and technology. This issue also introduces a new column, Sciences, Publics, Politics, by Matthew Nisbet. In his inaugural column, Nisbet explores the question of openness and accountability in philanthropy, as foundations prepare to spend $4 billion over coming years to advance their agenda to reduce climate change. In books, Susan Fitzpatrick takes a look at the current state of neuroscience in her review of Chasing Men on Fire: The Story of the Search for a Pain Gene by Stephen G. Waxman and Understanding the Brain: From Cells to Behavior to Cognition by John E. Dowling. Lav R. Varshney assesses A Mind at Play by Jimmy Soni and Rob Goodman, a new biography of Claude Shannon, a lesser-known pioneer of the digital age.